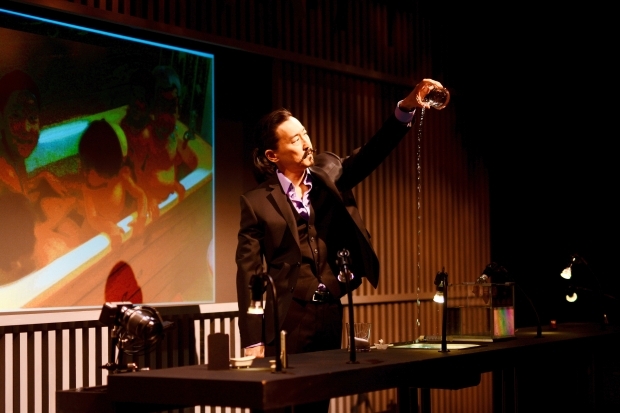 Tetsuro Shigematsu has created an autobiographical masterpiece that is a tribute to his father and a beautifully crafted piece of theatre about the power of family relationships. He chronicles his life as one of five children, including a twin sister, who would all bathe together growing up on Montreal. He spent his teenage years as an anarchist skateboarder and had a complicated relationship with his father, Akira. Neither of them shared their feelings, but they usually came to a silent understanding. Although he vowed to be nothing like his father, he ended up on CBC radio, just as his father was. One of the many props that keep his father’s spirit on stage with him is his iconic brown leather, CBC logo embossed messenger bag. Shigematsu once asked to borrow it because he thought it was cool, and, embodying his father’s voice, he tells us that only an employee of the Canadian Broadcasting Corporation was allowed the honour of carrying such a bag. Other artifacts from his father’s storied life include letters his father wrote to him and the first (and only) page of his never-finished autobiography. Another item he has saved are his father’s yellow ear protectors that he would wear when on air — and continued to wear after being demoted to a mail clerk position when the CBC International Service was shut down. These artifacts are carefully and reverently woven into the story as we learn about this enigmatic man who survived Hiroshima, immigrated to England and then Canada, had tea with the Queen of England, and witnessed Marilyn Monroe sing “Happy Birthday” to JFK. Shigematsu reflects on how his father’s experiences and traits have been passed on to him, and he worries that he will pass some of these things on to his own children, such as the inability to cry. He worries that he won’t be able to cry at his father’s funeral and that his children will think he’s a psychopath. Near the end of his father’s life, he interviewed him and has kept the recordings. He described the “prairies of silence” between his questions and his father’s answers, symbolic of the chasms of silence that were between them for much of his life. Although our family members eventually leave us, their influence and contribution to our identity will always be with us. The personal artifacts, his father’s belongings, home videos, and family photos all make this a deeply intimate account of the power of family connections and the influence our parents ultimately have on our lives. Shigematsu is a natural storyteller and included just the right balance of humour, nostalgia, and grief along with some creative real-time filming tricks that add to the wonder of it all. It’s easy to see why the show has sold out three runs since 2015, and it’s set to become a classic of Canadian theatre.